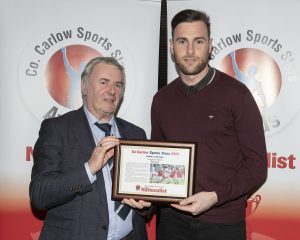 THE Talbot Hotel in Carlow was the venue on Friday night for the final Co Carlow Sports Stars quarterly awards for achievements in 2018 with the county’s finest sporting performances during October, November and December honoured. A big crowd turned out for the occasion with eight awards handed out recognising a wide range of sports. Perhaps the largest group was the Muinebheag minor hurling squad who brought a county title to Bagenalstown in October. There was also a large contingent from Carlow Gymnastics Club with their national championship-winning 11 to 16 team honoured. Carlow town’s Steve Lennon picked up an award in recognition of his appearance at December’s PDC World Darts Championships which took place at Alexandra Palace in London. The Gaelic football award went to Eoghan Ruth who played a starring role for Éire Óg as they clinched another senior county title. The rugby award went to Charlie Ward from Tullow who played for the Ireland under-19 rugby team against Australia in December while the soccer award went to Kylie Murphy, Lauren Dwyer, Aoibhin Webb and Cliodhna Ni She who were part of the Wexford Youths women’s team who won the FAI Cup, National League and Shield treble. There was also a lovely piece of silverware on show when the Carlow Hunt Pony Club Team of 3 Hunter Trial national championship winners came to pick up their award. Karate was also well represented when Annelie Burke and Niamh Ralph of Carlow Karate Club and Jasmine Byrne of Ballinabranna Karate Club picked up awards after winning gold medals at the Euroepan Championships in Russia. The overall gala award night for 2018 takes place at the Woodford Dolmen on Friday 22 February. The winners have been announced on page 1 of this sports section.